First, the "gay guy" in question is Peter Bartholow, CEO of Los Angeles-based Lab Zero Games. 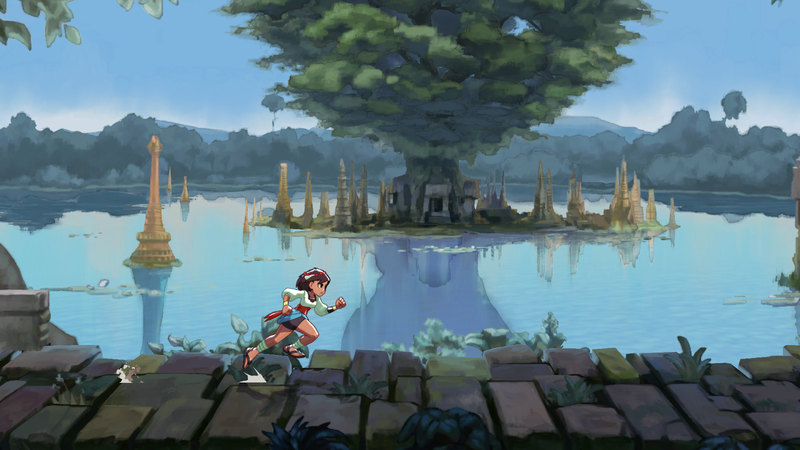 Second, Indivisible, in case this is the first you've heard of it, is a two-dimensional action RPG--inspired by both Valkyrie Profile and Super Metroid--that Bartholow and his team hope to release for PS4, Xbox One, PC, Mac and Linux in 2017. If you're still on the fence as to whether or not to hand over some of your own hard-earned cash for this intriguing effort, the following tête-à-tête--about Indivisible's origins as well as the gay content mentioned in the header above--with Bartholow may help nudge you toward the "yes" side of the equation. 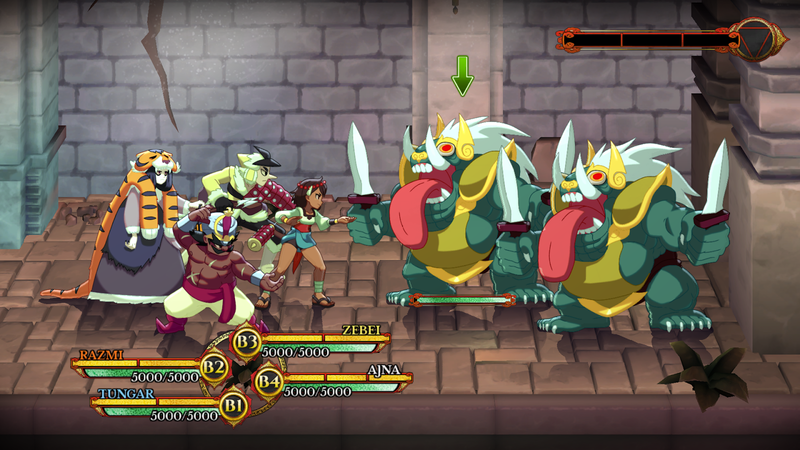 The Gay Gamer: Indivisible's Indiegogo page describes the game as being inspired by Valkyrie Profile and Super Metroid. Why those two games? Were they simply games you enjoyed playing back in the day, or is there more to it than that? Bartholow: Indivisible actually began as a pitch for another publisher--they requested something along the lines of Child of Light. So we all played it, and our main takeaway was that it was a hybrid platformer-RPG. We thought about other platformer RPGs, and Valkyrie Profile immediately came to mind, since it’s one of our favorite games. As we thought more about Valkyrie Profile, we thought about what we’d like to change. The first thing we decided to do was remove the time limit so that players had more opportunity to explore and enjoy the game as they saw fit. And that got us thinking--RPGs typically have a strong exploration component, so what are platformers with a strong exploration component? Naturally, Super Metroid came to mind. 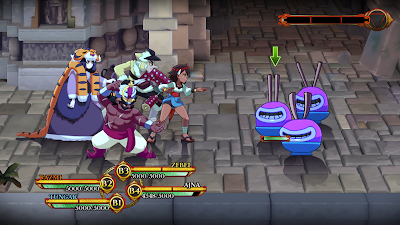 The addition of new progression abilities and weapons fit nicely into Indivisible’s nascent story, and so we started heading down that route. The Gay Gamer: You've also brought up Chrono Trigger in past interviews about Indivisible. How does that Squaresoft classic fit into all of this? Or to put it another way, which aspects of Chrono Trigger will be seen or heard or felt in the final version of Indivisible? Bartholow: There are subtle touches here and there influenced by Chrono Trigger, such as how the enemies are in the environment and you fight them right there. But probably the main influence is our approach to the story. In Chrono Trigger, each era was sort of an episode focused on a particular character or characters who, in addition to being involved in that era’s story, also served as a guide for Crono and Marle to help them settle into the events they’ve stumbled into. 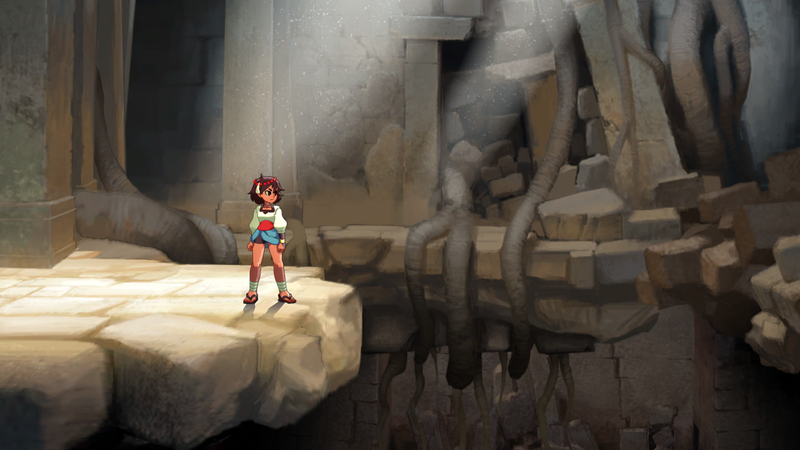 So our goal is to give each region of Indivisible’s world and its story a similar feel, with interconnected episodes anchored by strong characters. 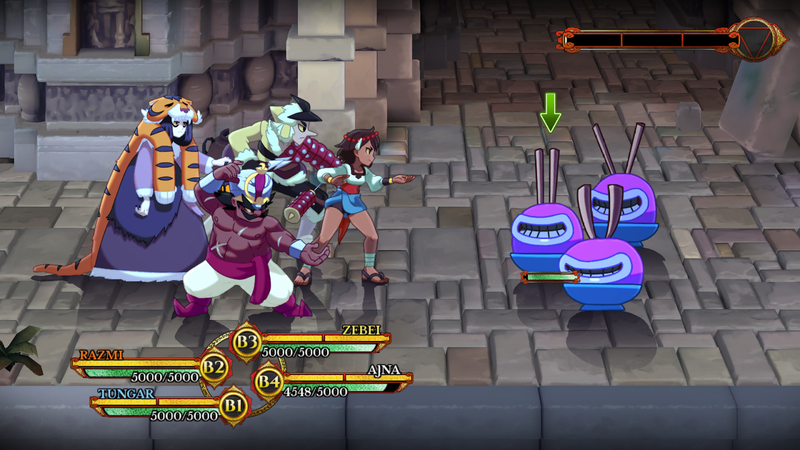 The Gay Gamer: Will people need to have played--and enjoyed--all of those games to like Indivisible? If not, what do you see as being the main reasons people who've never experienced Chrono Trigger, Super Metroid or Valkyrie Profile would be interested in your upcoming game? Or what should they expect out of it, considering comparisons to Chrono Trigger, Super Metroid and Valkyrie Profile aren't likely to spur their interest? Bartholow: I think it may help, but we’re certainly not making this game only for fans of those games. We’re not trying to make a spiritual sequel or anything like that, these were all just inspirations - a creative starting point for establishing our thought process and gameplay basics. If you’ve played any of those games and play the Indivisible prototype, I think you’ll see we’re already starting to diverge from them pretty significantly. It’s kind of similar to Skullgirls, in a way--Skullgirls’ original inspiration was Marvel vs. Capcom 2, but once we had that base, we kept building on it until it was something pretty different. But I have seen that Valkyrie Profile fans probably have a bit of a leg up compared to newcomers, just because they’re already somewhat familiar with the battle mechanics. The Gay Gamer: You mentioned in your initial e-mail to me that Indivisible will have some sort of gay content. Can you tell me more about that? What form will it take? 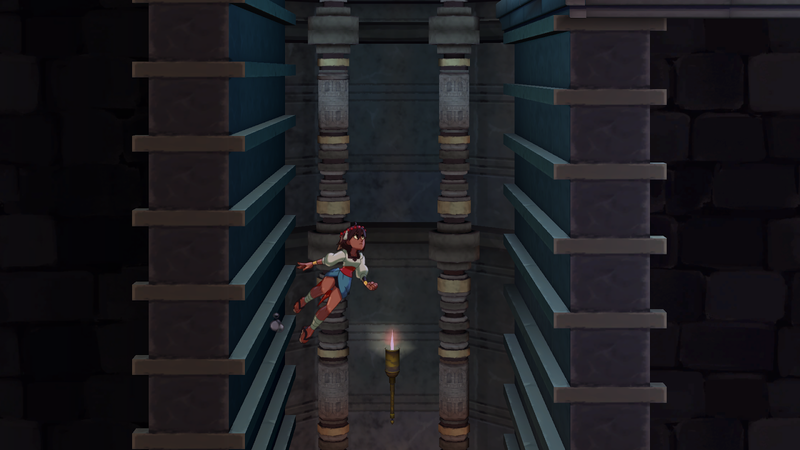 Are we talking about a major element of the game--the protagonist Ajna being gay or discovering she's gay--or something a little less major, like a side character being open about being LGBT? Bartholow: A lot of these ideas are still forming, and talking about the ones we do have in mind right now would probably be considered spoilers. But, yes, we do plan to have LBGT representation in the game. I don’t think it’ll be a major element, mostly character detail and context. It’s important that we strike the right balance in making it feel natural, but also not call so much attention to it that they’re defined by their sexuality or gender identity. First and foremost, we want to make characters that are defined by what they do and say, not by what they happen to be. So, for example, a side-quest line might be about an Incarnation that Ajna has absorbed that’s worried about their lover. As you do the quests, and you find out the lover is the same gender. Not really meant to be a big reveal, but it’s there, and if you think back on the character and other situations in the game, you’ll realize it makes sense. The Gay Gamer: What prompted you to add gay content to this game? Why do you think it's important? Bartholow: One of Indivisible’s central themes is how a diversity of viewpoints is stronger than a monolithic one. Even though the game isn’t set in America, that’s a pretty American ideal, and that was one of the reasons for the title. So we wanted to extend those viewpoints beyond country and skin color and into sexuality, gender identity, disabilities and other aspects of the human condition that inform our worldviews. 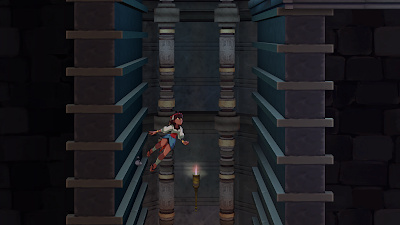 For example, while Ajna grew up in a remote village, she’s strong, has never had to struggle and probably doesn’t have the perspective and vulnerability of someone like, say, Yan, who was abandoned by her parents because she was born without arms. So as Ajna meets and fuses with these varied characters, it will give her perspectives and the accompanying empathy she might’ve otherwise lacked. Again, it’s really important to us that we treat this with sensitivity. While including these kinds of characters is a goal of ours, we don’t want to force it. If we don’t feel we can do it right, we’ll hold off until we can. The Gay Gamer: Are you at all worried that including gay content in Indivisible will turn off some potential buyers? Bartholow: Not really? We now live in an era where large corporations are placing gay couples in ads for laundry detergent and fast food with increasing regularity. Many popular TV shows have equally popular gay characters. And when religious and anti-gay types attack them for it, they shrug it off. I’m not saying there aren’t risks, and maybe we will turn some people away, but if focus-tested corporate America now feels it’s safe to stop pandering to homophobes, why should we worry? And, again, we don’t want the gay characters to be defined by their sexuality any more than their straight counterparts are. I think we want any sort of reveals like that to be pretty understated. The Gay Gamer: Can you share any broader feelings or thoughts you have on the subject of gay content in video games? For instance, is this an area that you think is changing or evolving within the games industry, or are we still taking baby steps--such as by subtly including gay content--in that regard? Bartholow: I mean, I’m gay, so naturally I’d like to see more of it. To me it’s more about acknowledging that, yes, we do exist. And we can be heroes like everybody else. And just as homophobia tends to be generational, I think we’re seeing this come into play more as younger generations start to work in the games industry. When I was in high school, it was unheard of to be openly gay, but now that’s a pretty common occurrence. These younger generations of developers grew up around that, and are used to seeing gay representation in media, and probably even expect it at this point. So to them it’s natural to include gay characters and, if anything, the challenge is to convince their superiors that it’s OK. If you'd like to help Indivisible reach its Indiegogo goal, go to indiegogo.com and make a contribution by the end of this week.